mad orange fools: The Tuesday Night Cowl. 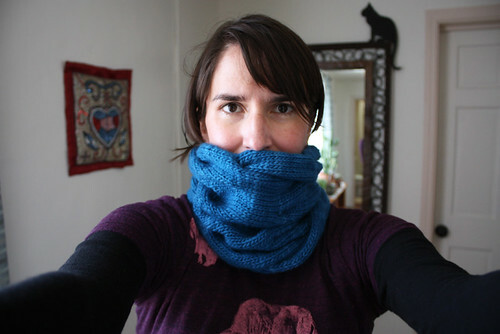 I've been wanting a new cowl all winter and now that I took a little break from knitting "work", I managed to get one done. 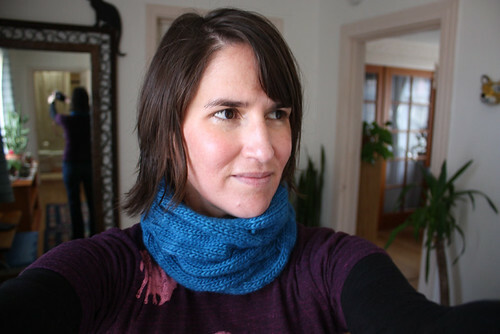 It is the Tuesday Night Cowl (Ravelry link) and I really love it. I wanted something kind of chunky without being overwhelmingly chunky. I also wanted it to fit a bit more closely around my neck than the one I made last year. And I didn't want it to be too wide. Wide is good for outside, but I was thinking more of something to wear around the house. Looking at the photos of this pattern, it seemed to fit the bill. I love cables and this pattern is all about large cables. 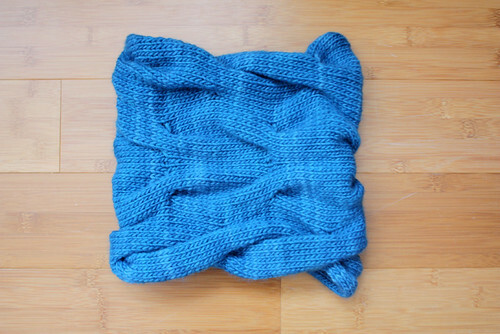 And the pattern has directions for chunky, aran and worsted weight yarn. Which means you can sort of play around with the size by using the instructions for aran with worsted weight yarn to get a slightly smaller size. I just happened to have some of my favorite yarn ever in my stash, Malabrigo Worsted (leftover from the cowl I made for Sandra) so I was good to go. For once I did not have to buy anything for a new project. It knit up quickly and I decided not to block it because I like the "scrunched up" look. And while it is a bit wider than I wanted, it works. When it's pulled all the way up, it's good for heading out into the cold. And for inside, I just fold it over to the inside and it's perfect. I've been wearing it nonstop since I finished it the other day. I'm so sick of turtlenecks and yes, I know this goes around my neck, but it feels less claustrophobic. I love it! I love your blue colorway. I am making one now with Elann.com A series W01 in a lovely variegated red orange and gold. I hope to enjoy mine as much as you enjoy yours. 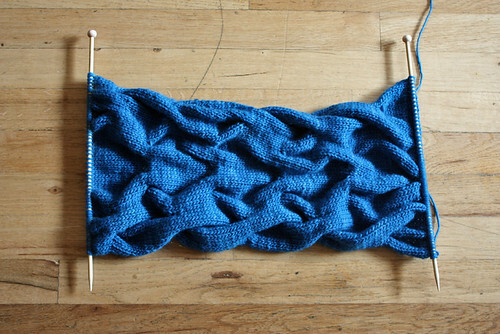 It knits as a light worsted and I am using the Aran weight pattern to make mine a little smaller too.